My night owl self has been recently trying to convert to being an early bird and today I actually succeeded with an early walk, some quick blogging, and a beautiful breakfast. I thought it was awesome that I not only felt great being up before my kids, but that I was also more motivated to actually eat a healthy breakfast. 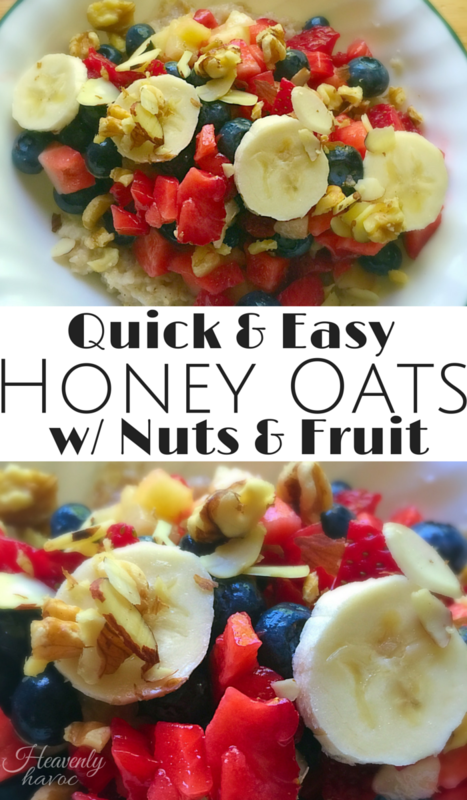 These Honey Oats w/ fruit and nuts were so delicious, I’ve decided to make them a regular part of my morning routine. Unfortunately, I might just have to hit the store for more blueberries…. But, seriously, doesn’t this look like a beautiful breakfast to start the day? I love that it’s packed with protein, healthy fats, AND antioxidants! and the best part is….it’s EASY!! My life is too crazy this summer to spend time on breakfast so this is definitely a win win! Put quick oats and water in microwave sage bowl and cook for 90 seconds. Remove from microwave, add honey and cinnamon and stir. 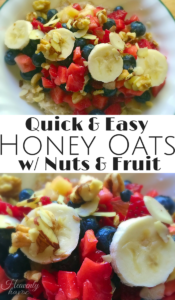 Top with your favorite fresh fruit, nuts and milk! See how easy that is? Soo good!